That is the only way to start what might become an advanced poem—not that advanced poems even exist at all! Poems are swimmers in the sea, angling one direction, subject to big swells, the pull of the current—and there you are feeling coldness of the salt water coating you, the pink horizon nudging you closer, making you feel hungry for lunch. Perhaps a tuna fish sandwich? 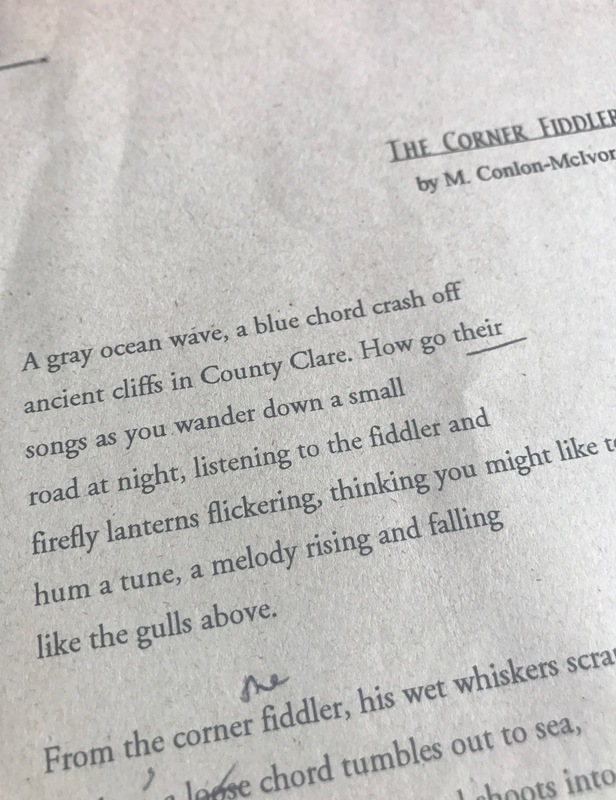 I have one poem called “The Corner Fiddler.” I’ve been working on it for ages, since I first traveled to Ireland—where my people come from. Sometimes I take my beginning poem out of the drawer, wondering which way it will go next. I try to be patient. Poems operate on their own time frames. I get quiet, listen to sounds of the letters, how vowels and consonants sway together like wind rustling through trees. Like the paper-white gulls circling above. Poems have been my refuge long before I knew what the word therapy meant. As a young person, I’d walk the streets of my Southern California neighborhood and observe the scene —inspect the world around me, noticing how words, like fairies, would land upon my tongue, feeling as if they had wings, asking to fly, sounds hoping to be uttered by me. Honestly! Then I’d bicycle over to my friend Joanne’s, who’d just moved to California from New York. We’d sit together on the cool, cement, front stoop chatting about what teens chat about. When day became night, I’d look up to darkness, and wham—it was as if I had fallen into a trance—as I’d begin reciting poetry to the moon, riffing, wild poetry off the cuff. I felt a little crazy, but it calmed my heart. When I reflect upon that time now, I realize the poems started showing up soon after the murder that shook my family. My dearest uncle, a Catholic priest who served the disenfranchised in a rough part of Queens, New York, was shot in the heart and murdered in his rectory on Mother’s Day. I was 13-years-old. My father, a special agent for the FBI, took a midnight flight to New York. When eventually he arrived back home, my father never uttered a word about the murder, the loss of his brother, the trauma to the soul. He stuffed it inside. I have no doubt that the repressed grief eventually killed my father way before his time. Fathers and daughters have special relationships, and I could not ignore my father’s stony silence. So I decided to put onto the page the emotion he could not express—life’s amazing beauty always in struggle with life’s inexplicable agony. At a young age, I learned all about paradox. Perhaps you did too—you know—some event in your life that marks the before period and the after period. A few weeks ago, in my hometown in Oregon, I joined the March for Our Lives demonstration in unity with the Stoneman Douglas High School students of Parkland, Florida, and with each step thought of all the young people whose lives have been shattered by gunshots. There are two things I can attest to: your life is never the same once you’ve witnessed the effects of murder. You don’t outgrow the grief. 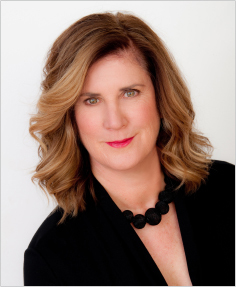 Grief fertilizes your heart so that you may grow a force field of compassion; a connection to your real self; and a determination to better this world in your own unique way. But how to get there when your heart still hurts? Consider writing your own beginning poem. Find a blank page or a blank screen to hold your words that are wilder than the wild swells around you. Let the words rise and fall. Let them roll off our tongue. Read your poem out loud. Read it to a friend. Feel how you feel. Put the poem down and imagine setting it free. Start your beginning poem now—it may help grief transform into grace. The beginning poem never ends. It is always life giving back to you. This entry was posted in Audio Diaries and tagged Gun Violence, March for Our Lives, Parkland Shooting, Poems from Grief on April 13, 2018 by Maura Conlon-McIvor.